Arden House detail (Lambeth, London). Photograph by Paul Shaw (2014). Arden House in the Kennington neighborhood of Lambeth, London was built in 1968. The name over the estate entrance is an excellent example of vernacular lettering: simple and unpretentious. The sans serif capitals are constructed out of flat strips of iron that have been cut and welded together. Combined with the bordering strips the design harks back to some of Charles Rennie Mackintosh’s lettering. The R is a plain grotesque/gothic. Detail of Great Northern, Piccadilly and Brompton Railway sign at Hammersmith, London. Photograph by Paul Shaw (2014). 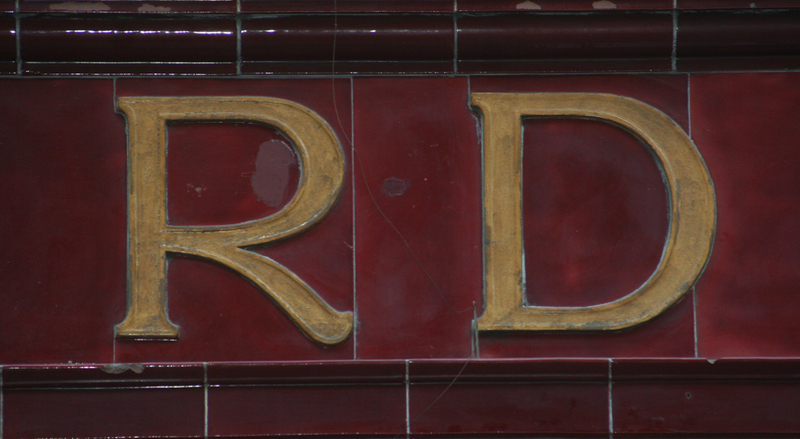 This second R is from a detail of an incomplete terracotta sign for the western terminus of the Great Northern, Picadilly and Brompton Railway in Hammersmith. The railroad, founded in 1902, was taken over by the London Underground in 1933. It is now called the Piccadilly Line. The lettering is pure Art Nouveau which is not common in London. The M is on par with Hector Guimard’s famed Metro lettering, but the R is weak. Its leg dangles limply from the bowl. Fortunately, it is visually buttressed by the curled S. And that green is lovely. Detail of Oxford Circus station sign (Soho, London). Photograph by Paul Shaw (2014). The Oxford Circus station of the Central London Railway was opened only two years earlier than the above GNP&BR station in 1900. (It is now part of the Central Line of the London Underground.) 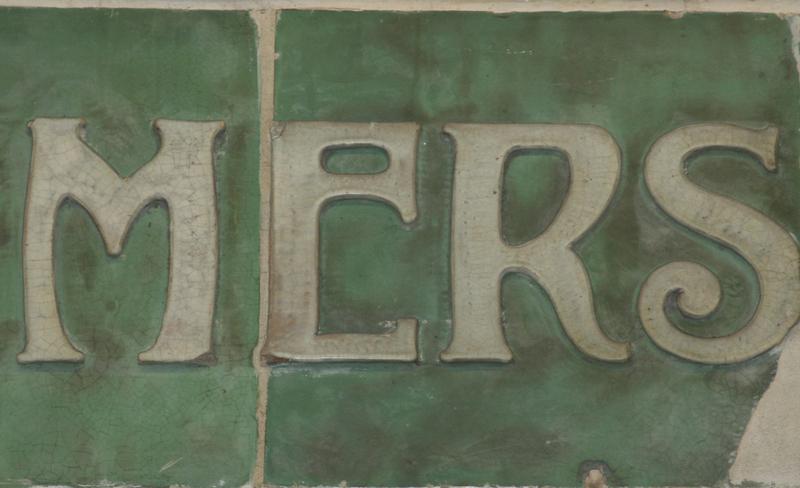 Its station lettering is also terracotta but Victorian in style rather than Art Nouveau. The gold and maroon colors are rich but the R is as weak as the one above and without the latter’s curvaceous swagger. The weak leg cannot be due to an attempt to ﬁt the R into a single tile—since the D (and other letters in the station name) are not similarly ﬁtted. The poor R is salvaged by the generous spacing of OXFORD CIRCUS. To see how important spacing can be, see the effect of the unpleasantly cramped spacing on the narrow letters ATIO of STATION (below). “STATION” detail from Oxford Circus station. Photograph by Paul Shaw (2014).